The decline and fall of peace treaties. What Ever Happened to Peace Treaties? 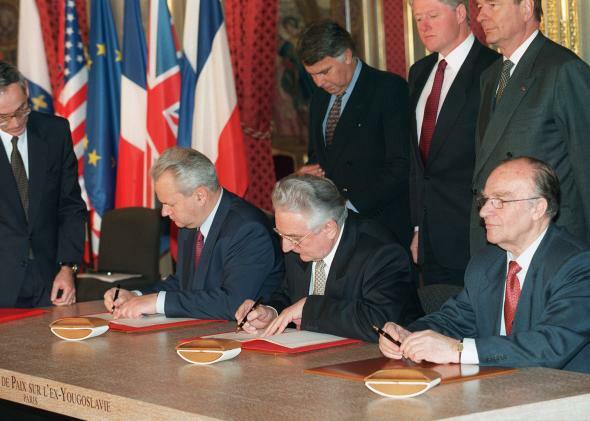 Serbian president Slobodan Milosevic, Bosnian President Alija Izetbegovic and Croatian President Franjo Tudjman sign the Dayton peace accord on 14 December 1995 at the Elysee Palace in Paris. Once upon a time, one country would declare war on another one, and fighting would continue until both sides signed a treaty ending them. As the current negotiations between the U.S. and Afghan governments to keep an American troop presence in the country until 2024 show, that’s not really how it works anymore – at least not for the United States. In a recent article for International Organization, Notre Dame political scientist Tanisha Fazal looks at the decline of peace treaties as a means of concluding interstate wars. While around the turn of the 20th century, nearly 100 percent of wars ended with treaties, today it’s only around a third. Fazal argues that this is because countries rarely admit that they are in a state of war in the first place today, preferring to label them. “police actions,” “counterterrorism,” or “counterinsurgency.” She suggests countries do this to limit their liability under international law. However, it also seems likely that it’s more politically expedient to conduct military action without a formal declaration. The flip side of this is that “peace treaties are increasingly being used to conclude civil wars.” Though given that negotiated settlements in civil wars often leave both sides in a position to resume hostilities down the road, this may not be an unambiguously positive development. Either way, something to keep in mind as we head toward Geneva II.